Heat a bit of butter and some peanut oil in a pot, and bake the turkey roulade on all sides nicely brown. Season the meat with salt and pepper. Add the pineapple slices with the juice and a small glass of port wine (shot). Also add a cube of stock. Turn back the heat and close lid. The roulade is cooked when the inside temperature of the meat gets to 90°C. If you don’t have a meat thermometer, the time to cook a roulade will take about 50-50 minutes. Put the meat aside to cut it in slices. Take out the pineapple slices for a moment and thicken the sauce to your liking using cornstarch. Put the pineapple and the slices of meat back into the sauce to keep them warm. Serve some slices of meat with some pineapple on top. Turkey is very light meat. So if you want this dish to be almost completely calorie free, then use pineapple in juice instead of syrup and serve the dish with a cooked potato .instead of potato croquettes. Always mix corn-starch in a small amount of water first before adding it slowly to the boiling sauce (e.g. 1 table spoon of corn-starch in a 3rd of a glass of water). This way you avoid clotting and you can control the thickness of the sauce you’re making exactly to your liking. Always stir while you add the corn-starch. The same process applies if you use potato starch instead of corn starch. If you have to bake meat for a longer time then it is important to choose fat which can stand heat. This is why we use half butter half peanut oil. The peanut oil can resist heat much better and the meat browns but doesn’t burn. 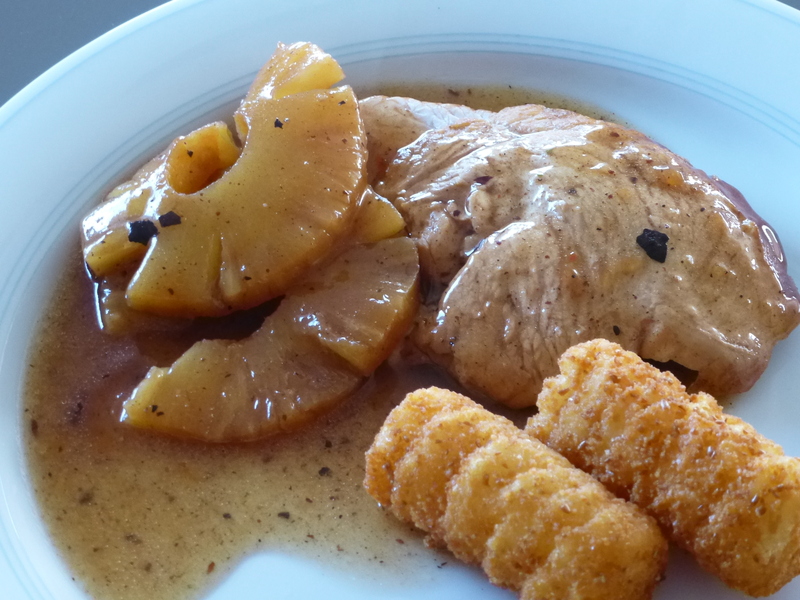 This entry was posted in Diet, Fusion, Poultry and tagged diet, low calorie, pineapple slices, turkey by petratant. Bookmark the permalink.